The Shaw Festival’s new production of Shaw’s Pygmalion transports the action from London in 1913 to the present. The surprise is how well the play works with only a few changes in vocabulary – prices adjusted for inflation, names for devices we use now replacing those used then, different swear words, etc. The main change is that, unlike the musical version of the play, My Fair Lady (1956), Hinton does not make Eliza Doolittle the sole focus of the play. The play’s title refers to the sculptor of a statue not the statue he creates, and Hinton makes the play as much about Professor Higgins, Eliza’s mentor, as it is about her. In so doing, the play seems freshly minted not just in its look but in its interpersonal dynamics. The show beginnings rather unpromisingly with Patrick McManus as Professor Higgins in his street clothes apparently conning his lines on an iPad. I’ve already complained several times in the past year about this directorial predilection to signal that the play is a play by pretending the cast is not ready for the show when it already has started. Luckily, Only McManus, not the entire cast is involved and this unnecessary prelude takes up little time. Soon enough the columns he has been walking behind are pulled back and become a building in Covent Garden where various people from vagrants to high society are taking refuge from the rain. As usual Higgins places the people around him by their dialects including Colonel Pickering (Jeff Meadows) whose background has been updated to “Cheltenham, Harrow, Cambridge and Afghanistan” with the last-named country replacing “India” in the original. To cover the set change a screen descends and we are shown part of a BBC documentary about research in 2013 that there are actually seven social classes in Britain rather than the familiar three. After the show you can visit www.bbc.com/news/uk-22007058 to take the “Class Calculator” to find out if you are in the “Elite”, the “Precariat” or somewhere in between. It is, of course, not news that that Britain still has a class system, so the film interlude suggests that Hinton feels he must underscore the fact that the issues in the play have not disappeared even after 100 years. Eo Sharp’s set design for Higgins’s study is all shiny black surfaces and electronic gadgets. Old-fashioned devices such as table telephones and radio sets lie piled in the grate of the unused fireplace, emphasizing unnecessarily how technology has progressed. The fireplace has been replaced with the monitor for a two-way visual intercom. Three computer monitors descend from the top of the proscenium to display sound waves. Unfortunately, the sound patterns are not related to anything anyone says on stage so that the monitors are just useless decoration. The greatest alteration to the traditional design is the concept for Mrs. Higgins’s at-home day in her drawing-room in a flat on Chelsea embankment. Hinton has reconceived the 21st-century Mrs. Higgins (Donna Belleville) not as a stay-at-home grande dame, but as an active, though elderly, avant-garde fashion designer à la Vivienne Westwood, with her “house” being her fashion house and her drawing room the main floor of her store. Costume designer Christina Poddubiuk lets her imagination run wild in creating unconventional yet attractive clothing for Mrs. Higgins and for her large staff made up of thirteen singer/dancers cross-cast from Sweet Charity. In general, Hinton creates too much hubbub with Mrs. Higgins’s minions coming and going, rolling about racks of clothing and in Act 2 even staging a fashion show. It all seems more like Hinton is trying to give the non-speaking ensemble something to do rather than using them to make any particular point. The most bizarre aspect of the show is that Higgins himself does not speak RP (i.e., “Received Pronunciation” which used to be the upper class standard employed by the BBC). This accent is used only by Colonel Pickering, Mrs. Higgins and Mrs. Eynsford Hill (Julain Molnar) and her two children Freddy (Wade Bogert-O’Brien) and Clara (Kristi Frank). Professor Higgins, theoretically, should speak the same way as his mother, but here he speaks with a middle class London accent. Apparently, he can teach RP but doesn’t choose to speak it. While this goes contrary to what one might expect, it’s possible that Hinton wants this to show us Higgins’s rebellion against his domineering mother and to demonstrate that RP is simply an artificial tool one needs to acquire to be accepted by the upper classes. For her part Harveen Sandhu does not adopt the usual Cockney accept associated with Eliza Doolittle. That accent is at present dying out. Instead, Sandhu produces a more generalized lower class (or should we say precariat?) accent punctuated with comically extended parrotlike exclamations that run into tetraphthongs if not pentaphthongs. If we set aside the series of minor oddities in Hinton’s production, we can see that Hinton, in fact, presents us with a very close reading of the text. At the end of the play, Eliza tells Higgins that she learned more about how to be a lady from Pickering than from him because Higgins could never see her as other than a flower girl whereas Pickering always treated her like a lady, or as she states, “He treats a flower girl as if she was a duchess”. In many productions we realize the truth of Eliza’s statement only in retrospect. In this production Hinton shows that it is true from the beginning. Higgins’s language and treatment of Eliza is abominable from the start, but Hinton makes clear that it is always Pickering who intervenes to ask Higgins to moderate his behaviour. 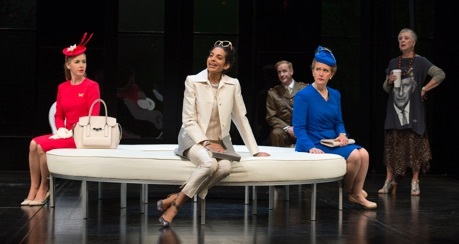 Hinton is quite aware that the point of the play, unlike the musical, is not merely that Higgins turns a flower girl into a duchess. Rather, the point is that Higgins has freed Eliza from the linguistic ties that bound her and thus unintentionally has allowed her to surpass her own teacher. The plays thus has a dual focus – one fixed on Eliza’s progressive success, the other on Higgins’s failure. The play consequently ends on a much more complex note than is usual since Higgins, abandoned by Eliza, comes close to becoming a tragic figure. As Eliza, Sandhu’s character makes the greatest journey, changing from a growling and hissing wildcat to a refined and thoughtful young woman. Yet, she shows even in Eliza’s request to take Higgins up on his bet that he can change her into a “duchess” that the permanent desire for change is stronger in this common flower girl than is her temporary resistance to Higgins and his methods. Hinton has the clever idea of showing Eliza in the scene reading British author Zadie Smith’s experimental novel NW (2012) thus demonstrating that Eliza continues to improve herself in Higgins’s absence and has moved into types of literature beyond his conservative tastes. In her final argument with Higgins, Sandhu hints that behind all of Eliza’s anger lies pity for Higgins’s inability to understand her. Patrick McManus presents a very different type of Higgins than usual. He emphasizes all that is childish and rude about a man who seems incapable of empathizing with his pupil. This is of a piece with the infantile way he behaves when visiting his mother. McManus’s Higgins is a man with a gift in one specialized area only, but no wider knowledge as a human being. His tragedy is that he is too proud and too insecure to change, a fact that allows Eliza to surpass him in every way. At the end he feels Eliza’s loss but has too little self-knowledge to understand why she leaves him. All the secondary roles are well played. Donna Belleville is especially good as Mrs. Higgins, a strong woman who displays more empathy and worldliness than her son. Jeff Meadows is a less stuffy than usual Colonel Pickering, whose inherent politeness from the start serves as an important foil to Higgins’s gruffness. Peter Krantz makes an amusing Alfred Doolittle, clad in a modern-day garbageman’s orange suit. He derives much humour from Doolittle’s attempts at being wily while being not quite bright enough to pull it off. Mary Haney is a treat as Higgins’s housekeeper Mrs. Pearce, here given a Scottish accent. Her presence, accent and common sense serve as a corrective to Higgins’s lauding of English as it should be spoken. Not only that, Hinton has her defiantly sport an apron referring to the Scottish separatist vote reading “Ah cannae keep calm, it was rigged”. The Eynsford Hill family all seem cut from the same cloth. In terms of style Poddubiuk has set them apart by dressing them all in a conservative style from the 1960s. They provide a counterexample to Higgins’s notion that an upper class accent means success. The Eynsford Hill’s all have posh accents, respectability and position, but are penniless. Julain Molnar communicates the hollowness of her family’s situation through her huffy brittleness. Kristi Frank gives Clara a rebellious streak but one not strong enough for her to act on. Wade Bogert-O’Brien makes Freddy likeable if slightly dim. Peter Hinton’s updating of the Pygmalion to the present emphasizes the timelessness of Shaw’s theme and will likely make the play feel more relevant and accessible to a larger audience. Even more important, Hinton demonstrates how wrong the sentimentalized ending of My Fair Lady is since it goes contrary to the universal human situation Shaw depicts of the student who surpasses her master. Here he powerfully uncovers in the play the tragedy of a man who can help others to change but cannot change himself. Photo: Jeff Meadows, Harveen Sandhu and Patrick McManus; Kristi Frank, Harveen Sandhu, Jeff Meadows, Julain Molnar and Donna Belleville. ©2015 David Cooper.